When you scan your body, where do you feel tension? Is your body holding or gripping anywhere? Could you take a deep breath in right now, and as you exhale, allow your body to relax in those areas. Allow your body to release any holding, and invite your mind to relax. In the last 10 years, I've dedicated myself to learn various movement and self healing practices so I can feel GREAT in my body and also share what I've learned and practice with you. I do body scan's like this all the time, and I make it my own game throughout the day : ) I invite you to do the same. I want you to understand that you are energy... and energy needs to flow. If you ignore your body it will send stronger messages: pain, numbness, it may lock up, back up and then you need outside intervention. The old way is to be isolated from your body, then go to someone else and have them tell you what 'is wrong' with you. 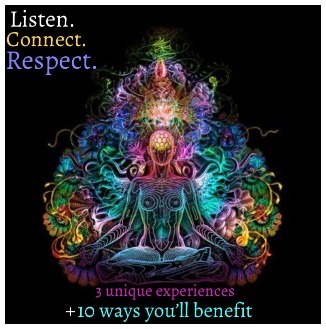 The new way is prevention/maintanence: listen to, connect with and respect your body and its messages. If you feel tension or are starting to lock up -->>> then move your body - likewise, if you feel good, keep it up... keep moving in ways you feel open, strong and mobile, so your thoughts and e-motions can flow and your Qi can continue to nourish and sustain your whole being. It is my wish that you to feel amazing and vibrant in your body! I want you to move with efficiency and coordination and to feel love within yourself on the deepest level possible. Do you want to feel amazing in your body too? 2) Physical Tension Released: I love getting physical tension to melt from the body. (Your shoulders and neck are my favorite target area!) Other benefits: increased joint range of motion and energy flow enhanced. 3) Inner Peace Reconnected: Deep inside you, peace and quiet exists. I assist your body to drop into this vast and timeless space. You leave refreshed with a new perspective. 5) Inflammation Reduced: Himalayan salt helps to increase energy, improve focus and reduce inflammation. Himalayan salt contains the 24 essential minerals our bodies need and helps to cleanse and detox the body as well. Saturate yourself in the salts and breathe deep to take in its healing benefits. 6) Mood Uplifted: This (200 year old) salt room floor is heated and thus releases negative ions into the air. With a surplus of negative ions in the air, your body releases the neurotransmitter serotonin, which is the feel good hormone. Just as the ocean shore and forests contain negative ions, so does this magical salt room, come escape and leave with positive vibes. 9) Breath Revitalized: My amazing colleague Lisa Meta is a transformational lifecoach and leads the biodynamic breathwork portion of our workshop. She teaches you about the power, quality and depth of your breath and how to use it to create change on a cellular level. Our tagline is: Breathe deep. Move more. Be you.